An American in Paris is a 1951 George Gershwin film that features a romanticized Paris in the 1920s and stars Leslie Caron and Gene Kelly. It tells the story of an American expat painter who falls for a French dancer while living in Paris and in this movie, romance flourishes despite the odds against it. I loved it. It is a beautiful and entertaining movie. It features great music and lyrics, stylized production numbers, evocative period sets and a wonderful cast that make for an entertaining film with romantic entanglements that responded extremely well to being transferred to blu-ray disc. Warner Brothers used their patented ultra-resolution process to bring this film back to life. That means they went back to the original 3 strip technicolor negatives and realigned them digitally. As a result, the color and detail is unlike anything we have seen before on home video. In the dance number, where Leslie Caron takes on different personalities using different dances and colors, you will not believe the quality of color. It really was beautiful. If you have a blu-ray player, make sure to chose the blu-ray version of this movie. Click here to order your copy of An American in Paris from Amazon. You'll get a kick out of this very original trailer, which is the most complete trailer I could find on Youtube. It is rough but it does a far better job of telling you the plot of this movie than I can and, of course, if you go on to watch the movie in blu-ray you will know then that the quality...well, 'S Wonderful. Of course, you can watch the trailer or simply choose to turn on the music and leave it running while you read the rest of this page! 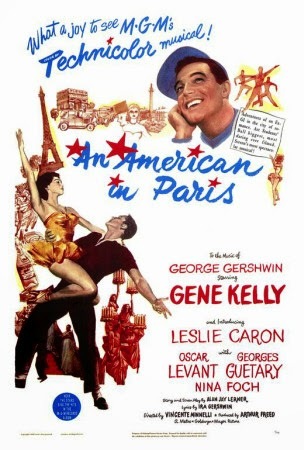 An American in Paris won six Academy Awards, including Oscars for Best Picture, Best Art Direction, Best Cinematography, Best Costume Design, Best Music and Best Writing. 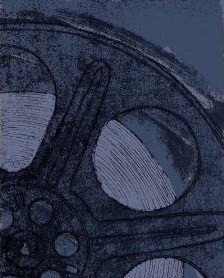 It went on to win a place on the American Film Institute's Top 100 American Films of All Time, landing in the 68th spot. Blu-ray.com says that it was a "...stunning restoration and video transfer, a solid presentation of the film's original mono track, and a well-rounded collection of supplements that adds a lot of value to the disc. If you're a fan of Gene Kelly classics or other notable musicals of the period, you won't be disappointed." Combustible Celluloid compares the two most remembered movies that Gene Kelly made, Singin' in the Rain and An American in Paris. DVD Beaver says that "this blu-ray image is beautiful...The improvement, in all areas, borders on spectacular. Beyond detail, which we expect to be superior, colors are more vibrant (closer to the Technicolor ideal), contrast and black levels are pristine...The bottom line: no blu-ray library should be complete without this movie." In their print edition written at the time of the release of this movie, Sound and Vision Magazine said, "...this may be the most ravishing blu-ray disc - not only of a classic film but also of any film - that this reviewer has ever seen (and he has seen a bunch.)" 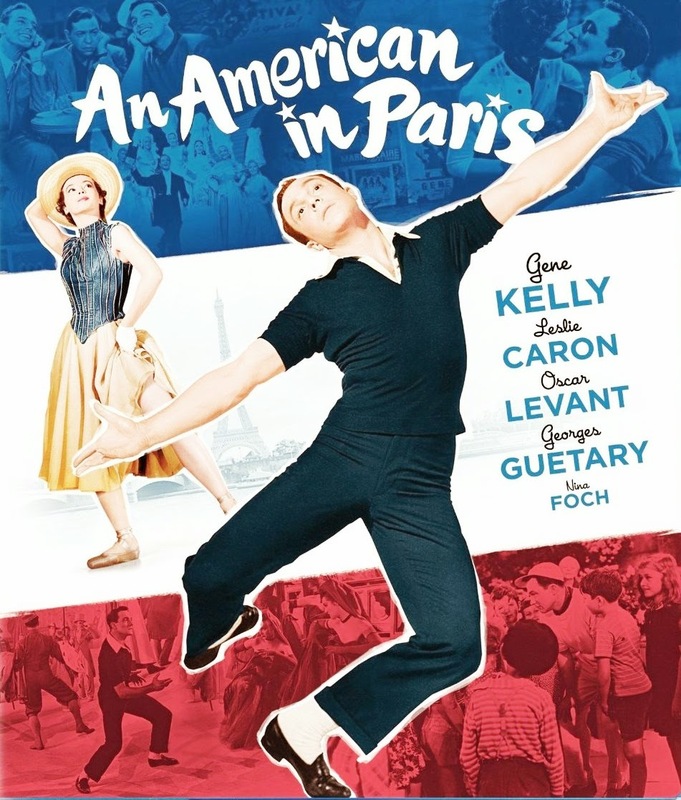 The climax of this movie is "The American in Paris" ballet, which runs for 18 minutes and features Kelly and Caron dancing to Gershwin's An American in Paris. It is said that the ballet cost more than $500,000 to stage, an incredible amount of money at that time. To some, the plot is considered secondary in this movie. Director Vincente Minnelli brought together a group of extraordinarily talented individuals with Gene Kelly as choreographer and they went on to create "a rapturous musical not quite like anything else in cinema." The end of the film includes 17 minutes of dance that required a month to make. Songs you will recognize include " 'S Wonderful," "I Got Rhythm," and "Love Is Here to Stay." 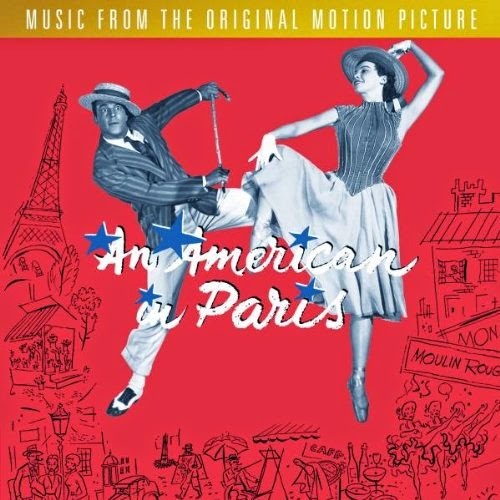 Click here to order the American in Paris movie soundtrack from Amazon. Anyone who loves a fun, romantic story that features plenty of dancing and singing. Anyone who loves period movies. Anyone who loves armchair travelling and/or the city of Paris. Anyone who wants to see their HDTV and blu-ray player perform! Be sure to report back if you watch it and let us all know what you think. 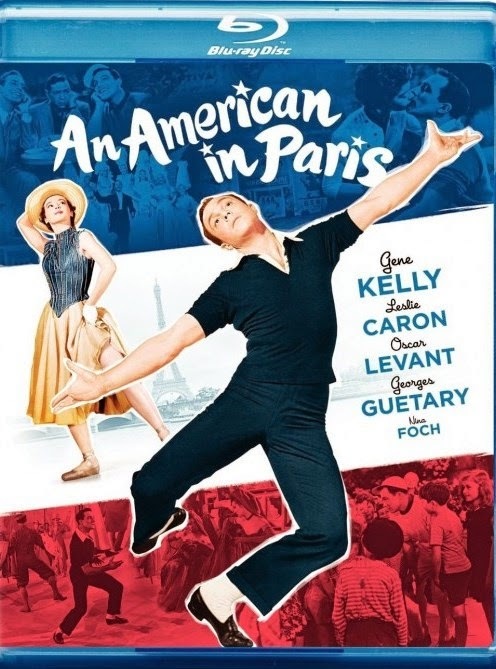 Buy An American in Paris from Amazon. On Pinterest? You'll want to follow the fun on Movies & Trailers. Love this movie. The ballet is astounding. Adore Gershwin. It is a great movie; I was truly impressed when I saw it for the first time a few years ago.